From cottage, lodge, and campground updates to signage, trail, and amenity upgrades, chances are the next time you travel to a Kentucky state park, you’ll see something new and improved. Thanks to an $18 million park improvement allocation approved by Governor Matt Bevin and the state legislature in 2016, roughly 100 refurbishment projects are underway at some of Kentucky’s 49 state parks—making what many consider the best state park system in America even better. On an unseasonably warm morning in early March, longtime friends Gene Hurst of Pineville and Zelma Quillen of Middlesboro traveled to Cumberland Falls State Resort Park to celebrate Quillen’s 80th birthday. It was Quillen’s first time at the park. “It really is not what I expected. The falls are a lot bigger than I had imagined. It’s absolutely beautiful,” she says. Nearby, crews were working on handrail and trail improvements at one of the park’s most popular observation platforms, ensuring that future guests can be just as wowed by their first view of the falls as Quillen was. 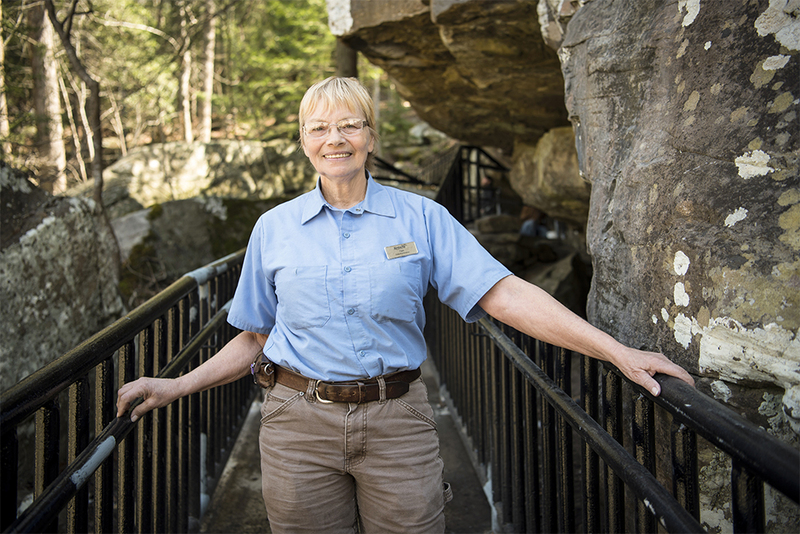 Recent floods had pushed large pieces of dead wood through the railing on the platform, causing gaps large enough for children to squeeze through, explains Pam Gibson, trail maintenance supervisor at Cumberland Falls. “These repairs had to be done, or they were going to shut this whole trail section off completely, and people would have rioted. We have people come for wedding pictures here, with the falls in the background,” says Gibson, a South Kentucky RECC member from Stearns. Steve Combs of Junction City and his crew from Fracon LLC reinforced and refurbished the original, 1930s-era steel handrails, adding new gates and shoring up the observation platform with a new concrete base and stainless-steel supports that are rust-resistant and better suited to withstand the area’s frequent flooding. Blane Kretzer of Corbin and his team were tasked with adding the final layer of paint to the handrails—a job he took particular pride in. “My family and I come here often with our pets. We enjoy the park very much, so I was pleased to get the call to work on this project,” he says. About half of the $18 million has already been committed, Holland says, with projects underway at many of the parks. The work includes concrete walk and building repairs, roof repairs, pool and campground improvements, and interior and exterior painting. “At several parks, guests will see freshly painted cabins, many of which had not been painted in decades. We’ve had a lot of concrete work scheduled, addressing walkways that were cracked and uneven, and in some cases 60–70 years old and beginning to crumble,” Holland says. Other noteworthy projects include the moving of the marina at Rough River Dam State Resort Park to a deeper area of the lake, to make it accessible year-round; a refurbished tennis center at Kenlake State Resort Park; cottage interior renovations at Barren River Lake State Resort Park; museum renovations at Big Bone Lick State Historic Site; and a new golf cart fleet and conference center repairs at Lake Barkley State Resort Park. At Carter Caves State Resort Park, the lodge rooms have been renovated and the exterior painted, while work is underway to add new handrails and lighting to the park’s largest cave, Cascade Cave, allowing “guests to enjoy every aspect of the cave and remain safe doing so,” says Chris Perry, the park’s manager. The planned improvements benefit not only each park, but they offer a boost to tourism across the state. Tourism generated by the state parks contributes an estimated $889 million annually to Kentucky’s economy, according to a 2011 study—and the hope is that the more visitors enjoy their time at Kentucky’s state parks, the more they will want to return. “Guests come from all over the world to enjoy what Lake Cumberland offers,” says Janette Marson, tourism director for the Lake Cumberland Tourist Commission. “When you have a park that’s as popular as Lake Cumberland, upkeep is a must, so that we not only keep people coming back, but you attract new visitors as well.” Marson thinks the recent upgrades to Lake Cumberland State Resort Park’s lodge, grounds, restaurant, and cabins are helping do just that. In addition to being a key economic driver in our state’s economy, Kentucky’s state parks also hold a special place in the heart and memories of those who visit them year after year—for family reunions, camping trips, fall hikes, or lazy summer days fishing or boating. The latest round of refurbishing will maintain them for the next generation of guests to come. Veteran handyman Tommy Baker, known to listeners of Lexington’s NewsTalk 590 WVLK as the host of Home Hotline, a Saturday morning, home improvement radio call-in show, has decided to change things up a little after 25 years of hosting. Last year, Baker switched his format to include a Kentucky state park focus on the first Saturday of every month. The idea has been a hit, and he plans to continue broadcasting live from a different Kentucky state park each month throughout 2017 and beyond. “I love camping and getting out in nature,” says Baker, a Blue Grass Energy member from Wilmore who enjoys exploring the state parks with his wife and adult son. Last year, Baker broadcast from General Butler, Fort Boonesborough, Lake Cumberland, Kentucky Dam Village, Blue Licks Battlefield, and Natural Bridge. This year, he hopes to include in the mix Pennyrile Forest, Levi Jackson Wilderness Road, Barren River Lake, and Greenbo Lake, among others. During the one-hour program, Baker takes caller questions, talks about the history of the state park, and interviews the park’s manager and other staffers about its amenities and fun things to do there. Catch Baker’s state park radio program the first Saturday of every month from 10–11 a.m. EDT on WVLK 590 AM, which can be heard via broadcast throughout eastern and central Kentucky, or stream it live online from anywhere at wvlkam.com.